Photos of bloody trauma wounds. Videos of daring deeds that end with someone being mangled. Needles that you can’t imagine using on a human body, much less inserting into a bone. These images may sound gory, but they didn't deter students participating in a program aimed at getting them interested in medical careers. 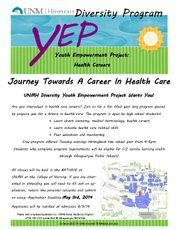 The Youth Empowerment Project – a series of classes offered by the UNM Hospitals’ Nursing Diversity Program – aims to introduce teens ages 14 to 19 to various careers in health care. During the summer, a short course is offered. During the school year, students accepted into the program meet every Tuesday for two hours throughout the year. Applications for the summer and fall classes are now being accepted. The upcoming classes will expose students to the world of trauma, surgery and women's health. All the short courses are educational, and they can be quite entertaining, students say. 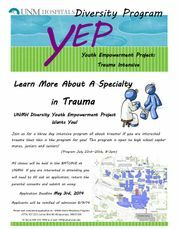 Mike Chicarelli, executive director of Emergency Services at UNMH, recently taught one of the trauma classes to a group of around 20 students. Mixing humor with the facts, Chicarelli had lots of good stories to tell but also made sure to give his young students a good dose of reality. Chicarelli told students that the UNMH Emergency Room – the only Level 1 Trauma Center in the state - sees 8,000 trauma victims per year and 95,000 ER visits per year. Students were mesmerized by the photos: gunshot wounds to the heart, a collapsed lung, stab wounds, shrapnel wounds, broken bones and head trauma. Chicarelli also passed around the equipment used to treat various injuries, like a chest tube and a device that has 14-gauge needles surrounding a harpoon needle that is used to insert an IV directly into a bone. Despite the the images, students did not seem deterred. Chicarelli asked students to raise their hands if they still wanted a career in medicine. All of them did. 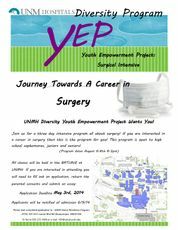 Enrollment in the Youth Empowerment Project is free. 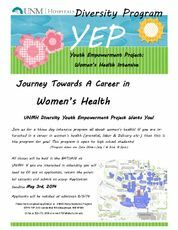 Those interested in an application for teens, please contact YEP at yep@salud.unm.edu. The application deadline for all summer and fall programs is May 3.